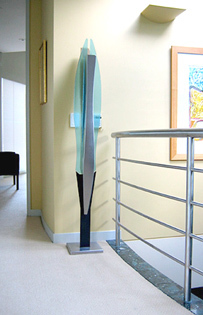 'Falling Angel II' is a sinuous stainless steel sculpture. In the second image, you can see that this sculpture was designed to have a smooth, strong vertical flow of steel and glass blades that focus attention within the deck space while providing an uninterrupted view to the beach beyond. Available as: this sculpture is hand made, to commission.